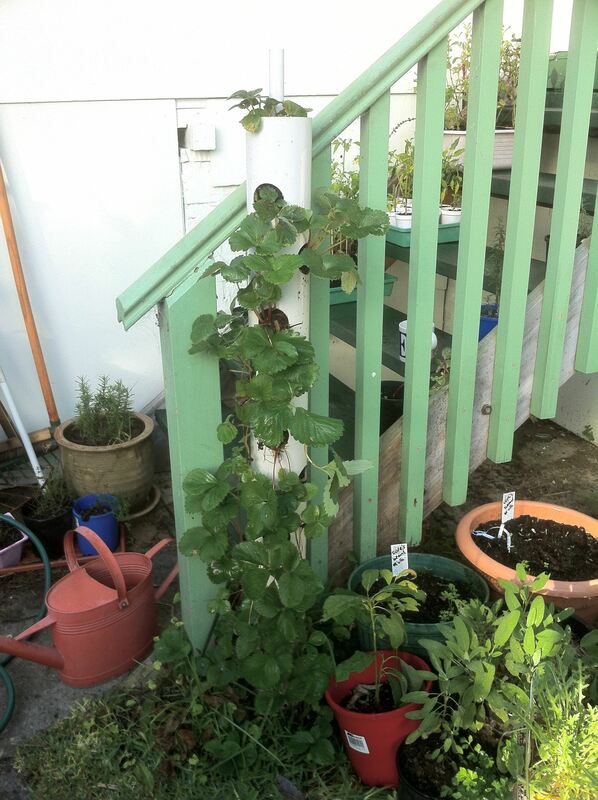 Seeing as this is around the time you should be planting your strawbs I thought it timely to write about this vertical strawberry planter I made a few months back. Instead of writing about it straight away I thought it would be better to test it first so have waited until it was established, yielding fruit and can advise on where I would do things differently. After I built this, I found a version for sale at a major garden retailer so you can just go and buy one if you can’t be bothered making it but they’re pretty easy to make. Parts and tools for the strawberry tower. Chickens not necessary! Drilling the watering tube for the strawberry tower. 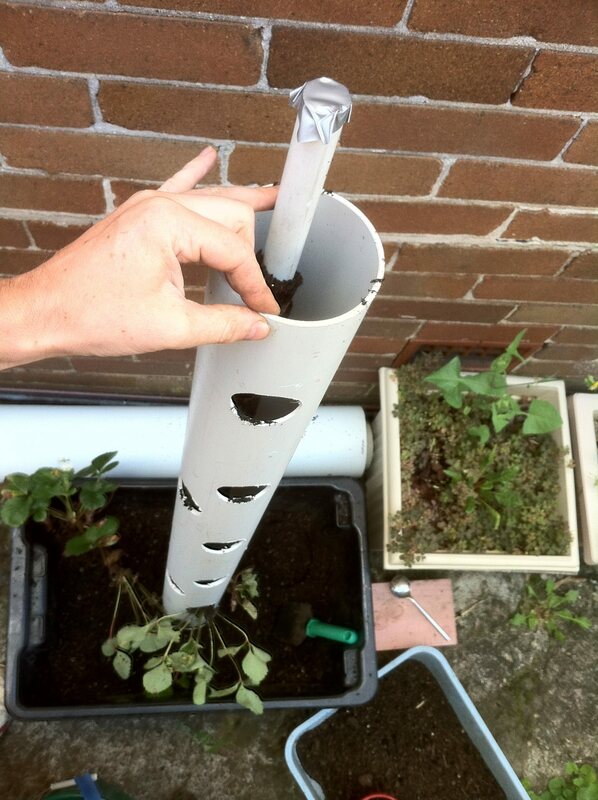 The completed watering tube prior to insertion into the strawberry tower. Cork has been attached and twine holding geotex in place. 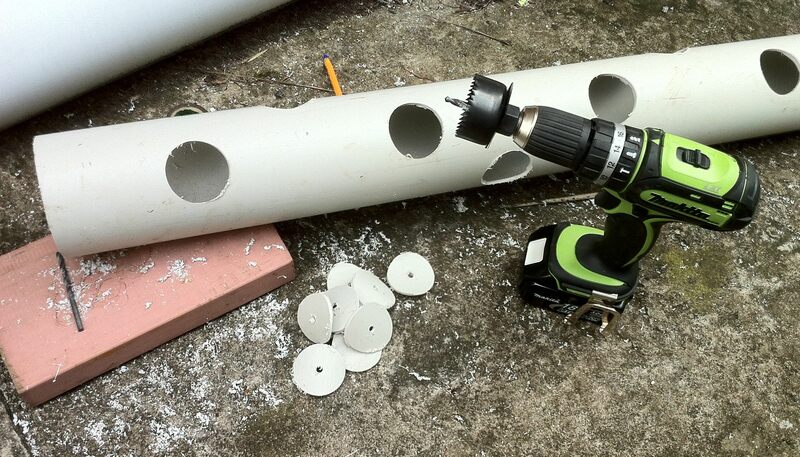 Cut the holes in the tower tube. Remember that one side will face the wall so only put holes on the surfaces that will get sunlight. I made 3 rows of holes and staggered them with holes about 20cm depth apart vertically. Leave the last 20cm intact with no holes. Some of this will be a reservoir of the lower level plants. Place the large container against the wall – a corner is best so the tube is less likely to fall over. Place end cap over the base of the tube (I didn’t seal mine so I can dissemble the unit and make modifications if necessary.) Insert watering tube then fill the bottom 10 cm with coarse gravel. Step 6: Planting: For the lowest hole I recommend planting a companion, less incentive for pests to climb up. If you are using stoloniferous varieties (those strawberries that spread with runners along the surface) you can leave a few gaps in the lower holes. As the runners cascade down you can poke them into these vacant spaces. Saves a few bucks, huh? When filling, I found it easiest to pour the soil from the top and poke the plants in the holes. Make every 6th one a companion. Once it’s planted find make sure when moving it that you hold it with one hand under the endcap if it’s not fixed. (Nothing like watching your plantings all shoot out the end to remind you of this necessity.) Secure it with your chosen fixings. Watering: You will need to do this daily in warmer weather. Vertical units do require vigilant watering. The last thing you want is for it to dry out! a few months later, the planter is almost invisible! Handy tip. If you are noticing ants farming aphids on your strawberries, locate their path then smear some orange/citrus oil around the unit at this point. Stops them in their tacks! Great pic! Did you make that one? Is the bucket plumbed into it? Maybe someone with more time on their hands can cut & paste to pinterest? If you add a pin it button to your browser, you can pin from any site. Any pinterest user can easily add a button to your own browser bar, which makes almost all images appear with the Pin button on it. Give it a try, Patrice! Will the strawberries come back every year on this??? It will depend on how big the diameter if the pipe is as you will be limited by soil fertility. My inclination would be to place the soil after summer and replace any plants that are not performing. I would plant running strawbs up top and bush varieties lower down so you can just poke the runners into any holes left by plants that don’t survive the transplant process. So far the planter has been yielding steadily a few strawbs a day for many months. You have to remember to keep watering and feeding it and the odd handful of compost in the top when you notice things subsiding. That’s a pretty cool idea. I have a raised bed I grow strawberries in. I think it would look really good with one of those on each corner. Thanks for the idea. I have thought about using them like that. The good thing is you can have them running down into the soil if you desire, worms could access the towers. my everbear strawberries have overwintered in my raised/covered SqFt garden for 2 winters (zone 7) but I hate how they take over, and i really don’t have quite enough sun there, so this will solve 2 problems and I can’t wait to set it up…. my question is, do you keep them overwinter? do you move the pole, or do you replant for winter? was thinking i could just lay the pipe horzontal in the covered bed (i don’t really grow anything in winter) but that would be heavy. thoughts? Thanks for your question, Lane. As I am in Sydney Australia Where winters are very mild – I just leave it as is. It would probably serve you well if you get heavy snow- to perhaps unplant and then refresh the soil and plant again in spring. If it were me I would make two or three so I could experiment with leaving in situ and laying one down as you suggest and un/replant. Do you think you could use this with squash? Last year it took over, but the stem near the ground doesn’t get that big. Just curious…as you probably can tell…not a very good gardner, but I’m learning all the time! Thanks for the great idea. Can you plant this in a big pot so you can move it in the really cold winters? I love the wheels idea, i need pictures of all these great innovations! I am so execited to try this in my berkley ca wine barrels! 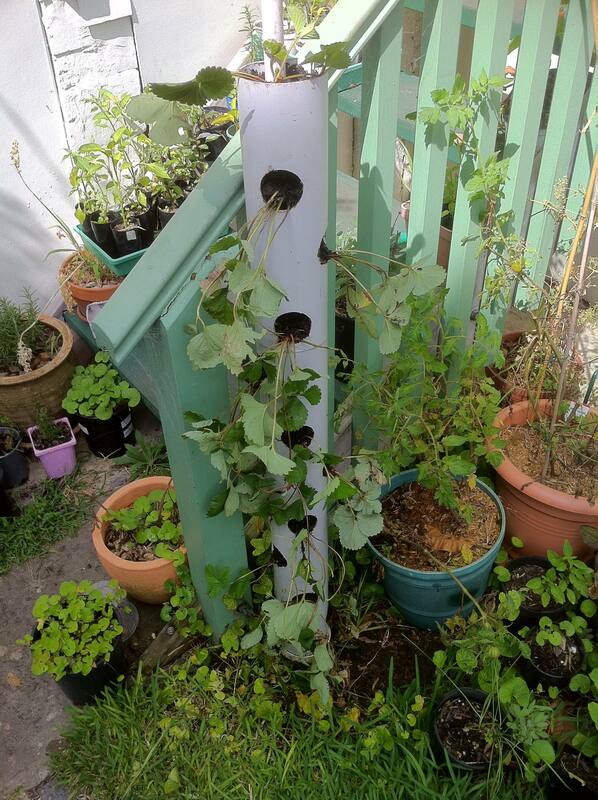 Looks like a neat way to garden vertically but I have to wonder how “green” it is using PVC plastic tubing. Perhaps a minimal amount if it were recycled material. Do you have any suggestions for other materials that are, perhaps, greener” I was thinking of maybe doing this using black locust boards. Copper or aluminum for the watering tube. Any thoughts? Wherever possible I use recycled as I have a place nearby which often has some. As for other materials I did see a cool aquaponics system using planks assembled into vertical rectangular “tubes” which looked great. I’ve read that PVC is quite toxic. Is there a risk that the chemicals in the PVC will leach into the soil and into the plants? I’m not trying to be a party pooper. I like the idea, just want to know if the PVC is safe. If you are in USA, your water is more than likely coming through PVC pipes. I would be surprised if there was a hazard using it in this application. Hey, My husband grows hay and wraps it for cattle feeding in winter, the rolls come on these hard pvc type black centers, I have been collecting these thinking I could surely use them for something. They are only around 3 ft long, but thinking of doing this for some flowers, maybe put them in the middle of a large pot and plant around and into the pipe, Thanks for the idea. You can also cut the pipe in different lengths paint them what colour you like and strap them together and they are like a sculpture with plants. Absolutely true Linda! There is practically no end to the different ways this system can be deployed. Thanks for a great idea I just finished mine but i made my one out of bamboo to give it more of a natural look . waaauw , even better and will look awesome !!!! Try a larger water tube & add chopped kitchen scraps and red wrigglers to the tube. The worms will go to work on your scaps & leak compost & castings into your main planter during your regular watering. Also,some worms will ‘escape’ into the main pot through the water holes you drilled. You get rid of kitchen scraps, have very happy worms & your plants will be ecstatic will be thrilled! Hi Rebecca, Yes I have used that same approach in wine barrels (see elsewhere on my blog) to good effect but I don’t think the worms would appreciate the daily drownings caused by watering. I think maybe “vertigation” may be a better approach. Thank you for your post! i tried to make the same construstion, and when i tried watering i discover that only low part will get enought water. 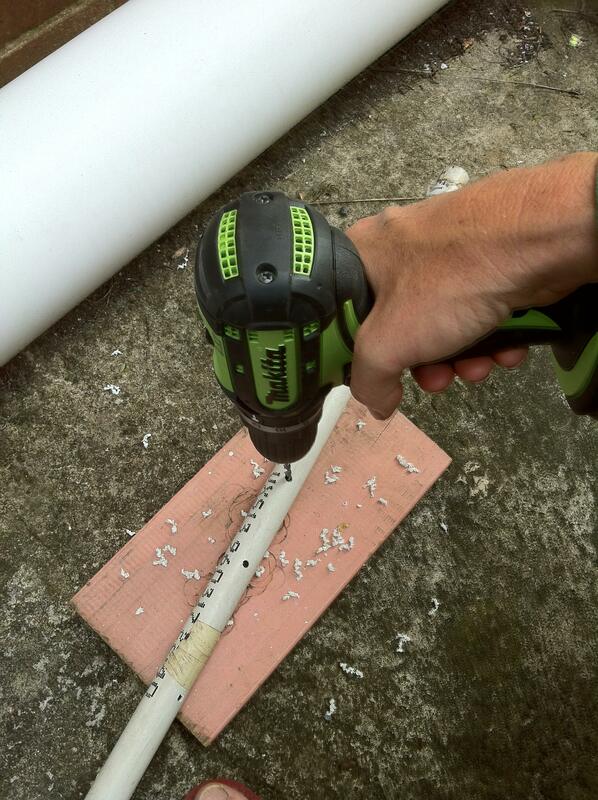 So i would reccomend to drill holes for watering only on 1st 10 cm of the watering pipe. Hi Ruslan, Did you try watering straight into the top as well as the watering tube? Mine works fine if I water both from the top and the watering tube but I will add some holes higher up as that will no doubt help. Thanks for the feedback! Great idea! But you must not have deer where you live! You sure got that right Debbie!Probably easy enough to make a screen for it though? I had trouble for years with deer until a friend said try “Irish Spring Soap” I cut it into cubes and drill a hole for a string and hang them all around on plants the deer like. No more problem. Was visiting a garden nursery this spring and saw all these bags, actually women’s hose, hung around. Ask the nursery owner what they were for and she said to keep the deer away. They were so numerous they were about ready to take over. She filled the hose with MILORGANITE and it has worked for her. She hasn’t had a problem since. I understand it’s good for organic gardening as well. Thanks for the level of details. What are your thoughts on growing pickling cucumbers in this manner? And also your thoughts on mixing like strawberries at top half and cucumbers at lower half? It would be on a 2.1 meter pipe from ground up with 1 meter buried. I am so doing this over the weekend! I’ve got two strawberry plants from my csa. Can I just pop in marigold/nasturtium seeds here and there or should they be transplants? I don’t really have any place I can secure it to, now a wall i can set it up against – maybe I could put inside another container with drainage holes and fill the outer container with rocks to secure it so it doesn’t fall over? Thanks so much!! Hi Barbara, you can do that for sure or drive a starpicket into the ground and secure to that. I have used a wine barrel to hold one and it works very well. I would favour young seedlings rather than seeds as you need something with a rootball to hold the soil in place and not fall out with watering. Try and keep your drilled holes small so that it’s just the collar of the stem coming through and not as much space as I had as you tend to loose a bit of soil that way. Many different types of plants could be planted in the holes. Love the idea…….also looks great!!! Ummm… what is geotextile… or hessian, for that matter? Hi Jennifer, thanks for asking. I’ll let wikipedia explain it, they’re way better at that than me! Hello! I’m in Brazil, in Sao Paulo. My Garden in Autumn and winter takes no sun. Could I plant strawberries without the abundant sunshine? Well I would probably stick with growing similar plants in each tube so for instance italian type herbs in one (as they all like similar soil conditions) and put the ones that like the least water at the top and the ones who like more water down lower just like you would plant a herb spiral. For fruit and veg I would do the same but as you would a rotation bed system so you grow families together like solanums in one, brassicas in another etc. Good luck and let us all know how it goes! I would treat them like you would a rotation garden bed system and grow like with like. So grow italian herbs in one as they like similar soil conditions, placing the drier habit dwellers at the top (rosemary) -just like you would if you were planting a herb spiral. With the others plant families together so solanums (tomatoes, chillies etc) in one, brassicas in another and so on. I don’t know what bearded dragons eat but with a bit of research it could be a fun experiment. Be sure to come back and tell us how it went! great idea for people with small gardens !! love it !!! I think i’ll have to make one of these! Chicago here. I covered the planting holes with painters tape to hold the dirt in as I set it up, then removed it as I started planting. I’m a big fan of square foot gardening since I’m a city dweller. I used the recommended soil mix of 1/3 peatmoss, 1/3 vermiculite, and 1/3 blended compost. I planted 23 strawberry plants in a five foot section, with one foot buried. In additon, I only drilled the planting holes at 2 inches and included a cap on the top with another hole drilled in to allow access to the watering tube. I figure both will help with maintaining water. One last tip, clip some of the root ball of your transplants to encourage growth when planting. Ooh! Assuming I could work out getting them to stand, we could make these _into_ a fence! Thats annoying for you, sorry about that. I have no idea. Is there not a link in the email footer that gives you an unsubscribe option? I had problems with slugs in my strawberry patch this past summer. I found that smearing lube grease around the lip of the planter helps prevent infestation. (It works best if the grease is refreshed after a rain or on a weekly basis.) Would you recommend using lube grease around the bottom & openings of the tube or do you have another method? Should I add a few earthworms to the soil to keep it healthy? And how do you fertilize? Thanks for the plans,instructions & your response to my inquiries. Great questions and apologies for the delay. So I would use a copper tape around the base of the unit rather than some kind of petroleum based product. Copper tape is very unpleasant for those slimey characters! You could add worms if you like – I have made a modified tube which features another tube connecting with the vertical tube on an angle. I use this to feed worms so its a wormtower with herbs or whatever growing above. Yes I would liquid fertilise every week at a diluted rate – feed lightly and often as they say. I would also replace the soil every year and replant. I make slug traps from a 1 liter soft drink bottles. Sprite or 7Up work great and are easy to camouflage under the leaves but clear bottles work as well. Cut the top 1/3 off and invert back into the base of the bottle. Tape it in place, add some beer or slug/snail bait. The pests crawl in but are unable to escape the trap. Beer is safer than baits but it’s really a personal choice. When the trap is full just toss in garbage. Happy gardening. I hate to ask a simple question that may be obvious to some but it seems to be omitted in the instructions and I am very to gardening let alone this vertical gardening technique. How do you water this vertical tube ? Does it tie into a hose or does it use some capillary effect? bonjour Urban, une petite question, le gravier rosier je le met au fond du tuyau de plantation ou du tuyau d’ arrosage ? merci pour votre réponse. Just a suggestion. If u put 2 or 3 screws in the end cap it will not come off until you want it to. Comment fabriquer sa tour à fraises ? Comme nous voici à peu près arrivés au moment de planter vos fraises il m’a semblé qu’il était temps d’écrire au sujet de ce planteur vertical à fraises que j’ai réalisé il y a deux ans. Mais plutôt que d’écrire à ce sujet j’ai pensé qu’il serait préférable de le tester en premier. C’est pourquoi j’ai attendu jusqu’à sa mise en œuvre suivie de la récolte de fruits de façon à pouvoir mieux vous conseiller et vous recommander d’éventuelles adaptations. Après avoir construit ce modèle, j’en ai trouvé une version en vente auprès d’une jardinerie bien connue. Vous pouvez donc aisément vous en acheter un, si vous n’avez pas envie de vous embêter à le confectionner par vous-même. Cet assemblage est assez aisé cependant. • Des colliers ou liens de fixation. Détail des pièces et outils nécessaires à la confection de la tour à fraise. Évaluez la longueur idéale de la tour et découper le tube principal en fonction. Ne pas oublier que le tube d’arrosage le dépassera de 8 à 10cm… Le mien fait la hauteur de la rampe de mon escalier situé dans un emplacement ensoleillé et la rampe de ce dernier me permet de le fixer. Percez des trous d’aération et d’écoulement tout le long du tube d’arrosage. Ne les percez toutefois qu’aux 2/3 du tube en partant du sommet. L’eau finira par s’écouler jusqu’aux plantes du fond. Si vous percez de trous l’ensemble du tube d’arrosage, l’eau se précipitera dans la partie inférieure, de sorte que la partie supérieure en manquera. Si vous préférez refermez la base du tube, prévoyez un petit trou pour éviter toute anaérobie à l’intérieur. Couper le géotextile ou la toile de jute de façon à recouvrir l’extérieur des trous du tube d’arrosage, et éviter le développement de racines qui viendraient les obstruer. Rogner ensuite soigneusement le bouchon avec un couteau jusqu’à ce qu’il s’adapte bien au bout du tube d’arrosage. Retenez-le temporairement à l’aide d’un ruban adhésif, afin qu’il ne se désolidarise pas au cours de cette phase d’assemblage. Photo : tube d’arrosage prêt pour son insertion dans le tube de la tour à fraises. Le bouchon a été attaché et la ficelle de maintient le géotextile en place. Coupez les trous dans le tube extérieur de la tour. Conservez à l’esprit qu’un côté sera exposé à un mur : vous n’avez besoin de faire de trous que sur la partie exposée à la lumière du soleil. J’ai fait trois rangées de trous tous les 20 cm environ dans la longueur plus ou moins en quinconce. Prévoir de laisser les 20 derniers cm intacts, sans trous. Cette partie servira de réservoir aux plantes du niveau le plus bas. Au niveau du trou le plus bas, je vous conseille vivement de planter une plante assortie, qui dissuade les insectes nuisibles de grimper le long du tube. Si vous utilisez des variétés de fraises stolonifères qui se propagent en surface par leurs extensions naturelles, vous pouvez laisser quelques trous inférieurs vacants. Vous pourrez remplir aisément ces espaces par la suite. Pour le remplissage proprement dit, j’ai trouvé plus facile de verser la terre par le haut et de faire entrer les plantes une à une dans les trous. Planter une plante assortie tous les 6 trous. Une fois les plantations finies gardez bien votre main sous le bouchon si celui-ci n’est pas fixé lors de vos déplacements (le résultat serait sinon désastreux pour vos plantations toutes fraîches). Fixez-le au besoin avec deux vis. Votre tour à fraise est en place. Arrosage : Vous aurez besoin de le prévoir tous les jours par temps chaud. Les tubes verticaux exigent une certaine vigilance dans l’arrosage vigilant. Sa surface d’échange thermique est large et vous ne souhaitez pas voir le tube se dessécher. Le fraisier est une plante très gourmande en eau qui demande à se développer dans une terre humide jusqu’en novembre. Dès la plantation arroser les fraisiers à raison d’une fois par semaine. Ne surtout pas négliger cette étape si le temps est sec. Ne pas laisser la terre sécher entre deux arrosages. Au bout de quelques mois plus tard, la tour est recouverte par la végétation. Conseil pratique. Si vous remarquez des fourmis entrainer des pucerons sur vos fraises, repérez leur voie de passage et répandez-y un peu d’huile essentielle d’orange ou de citron. Vous stopperez ainsi leur progression. Why not give measurements in inches and feet so we Americans can make this without translating the numbers? A 2 or 3mm drillbit for the watering pipe – these come metric in the U.S.
A narrower diameter (3/4 inch or thereabouts) length of downpipe for watering. Make it about 3-4 inches longer than the downpipe. If you have a pressurised irrigation system, you can use a length of soak hose instead. A length of geotextile (or hessian would do) for wrapping the watering pipe – this is the black landscape fabric at the garden store. Reblogged this on Meggys Patch @ Megs Web. I’m not a real gardener, but getting curious and would like to start gardening. I love strawberries and thought it would be a good place to start, where can I find everything I need to know? Such as, time to start in my area, what variety, basic info. & tips. this is planned for later this summer. I don’t know if I’ll get a reply since the last comment was May 2014, but I’m hoping. I’m a beginner at gardening and bought strawberry plants last year. I wanted to replant them this year in a way that didn’t take up as much space when I ran across your idea. I loved it and had my husband make it for me. Today we got it together with the plants and ran into a problem with watering. It was running out of the bottom so I had to turn the water down to a trickle. How much should the water be on? Curious to know if you still have this system up and running? What changes would you consider making? Now that spring is upon us, here’s a great idea for strawberries on the deck or any other small space. Do you mind if I translate it into my language (Croatian) and post it on a Croatian gardening site? It’s good practice to put on a mask when sawing it and drilling it as the dust from it isn’t great but leaching isn’t an issue once it’s in place. I recently tried this with geraniums. To date I have lost 12 plants and it looks like I’m up for another 12. I have found that once you put the conduit into the pipe it leaves very little room for the plants so you have to really squash them into the hole and its too traumatic for the small plants and they die. When I water them the soil falls out of the holes and makes a mess down the pipe so I put a bit of mesh into the hole to try and keep it in but it still makes a mess. I am going to try growing them horizontally and hang the pipes one under the other. Hi Tracey, Oh no that’s sad news. This design is really suited to strawberry plants as they have roots that are suited to this kind of container. 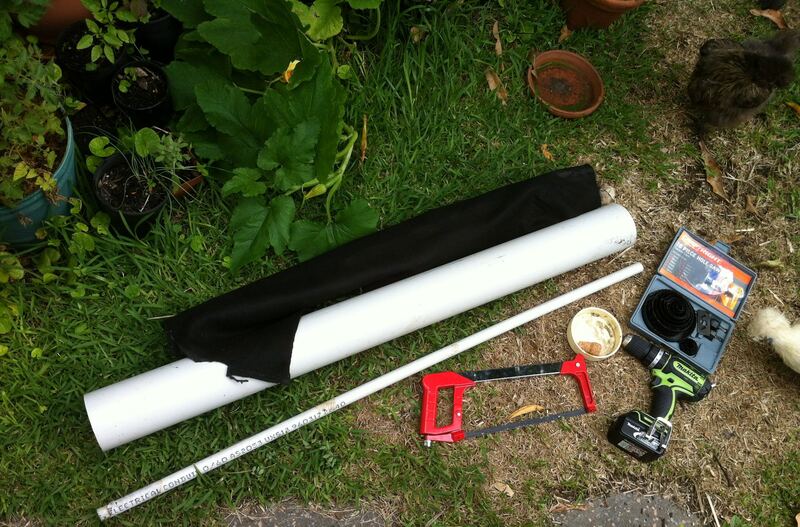 You could try a wider tube and then insert a geotextile/landscape fabric sleeve. Then slash and X to insert the plant. This is a good idea and something I’m looking forward to trying in the spring, especially since I love strawberries but can’t always get them. I do have a question though, in your list of supplies you have two down pipes of different sizes listed. One is 100/150 mm and the other is 15/? mm, what is the first one for, your instructions and photos didn’t say/show. I cannot figure out what the cork is for??? sorry if it was explained and I missed it. I am definitely doing this in the spring! As I am in zone 5 I will need to figure out a winterizing solution… Thanks so much for this GREAT Idea!!! Hi Pat, it’s to make sure the water doesn’t all rush out the bottom but out of the small holes along the length of the watering pipe. How would these survive winter in Alberta? I have had trouble with winterkill in raised beds with strawberries? Hi Nadine, I wouldn’t say they would do very well due to small size and above ground exposure. Reblogged this on Lisa's -Home for Books and More!. Might put a screw in the cap . For easy disassembly. Gracias x estas informaciones de los diferentes cultivos pero sobre todo este de fresa me encanto.. But, I have a question: do you have a whole- sale dealer for the plants because, as I realize, the cost of plants even at a boxed home improvement store is insanely high? If I try this idea I would make 3 or 4 about five feet high. With three lines of holes it would take upwards of 75-90 plants. That’s 12-15 flats of six plants. But, regardless the idea is unique and problem solving. Cudos to you and thanks for sharing. Sorry for delayed response. Have you tried growing from seed? THat would be waaay cheaper than plants. Another option is bareroot stock. Thanks for your comment! when I tried this I had a problem with the soil settleing down and the plants disappeared inside of the pipe .how did you keep the soil from settleing? Hi Marshall, It is tricky. I try and keep the hole as small as possible and am thinking I might try landscape fabric or shade cloth tubes with an X cut to push the plant through. I would be concerned that the landscape fabric would wick the water from the soil though. You could try a heavy clay loam soil around the holes as an idea…? I read all your comments and ideas regarding making a Plastic Pipe Based Strawberry Tower, I have three of these all doing really well. The one comment I noticed was about soil washing out of the planting holes when watering. There is a very cheap and easy cure for this and it works, when planting up use Brassica Collars, put them around the stem of the strawberry plant and tuck the outside edge of the collars inside the edge of the planting hole. You can get them on Ebay for roughly £2.50 for a 50 collar pack. Thanks Mike, Great idea. Love it!